Over 60% of the value growth in a forestry investment is biological growth, which adds continuous volume to forests. Trees will grow every year regardless of economic uncertainty, becoming more valuable as they grow from one product category to another. There are four main product categories in a tree. The wood used for pulp and energy products is generally cut from the top of the tree and has a smaller diameter. Pulp and pallet wood are generally extracted during the first and second thinning stages. Pulp and energywood are the least valuable wood products. Pulpwood has a range of uses including wall panels (OSB/MDF) and animal bedding. Ireland is the largest exporter of MDF products to the UK. Energywood is often used to produce biomass, supporting the growing demand for sustainable fuels. As per the Government’s National Mitigation Plan Ireland’s overall target is to achieve 16% of energy from renewable sources, including biomass, by 2020. Wind and wood fuels are the principal contributors to the renewable energy sector in Ireland. Stakewood is extracted during the first thinning and is cut from the middle section of the tree. Stakewood is used for stakes and fencing products in a variety of sectors, such as construction. Demand and prices for stakewood have remained consistent in recent years with large volumes exported to the UK market each year. Pallet wood, cut from the middle section of the tree, is used for packaging, panels and gardenfurniture. Pallet wood is usually produced during the first and second thinning with later thinning generating higher volumes. 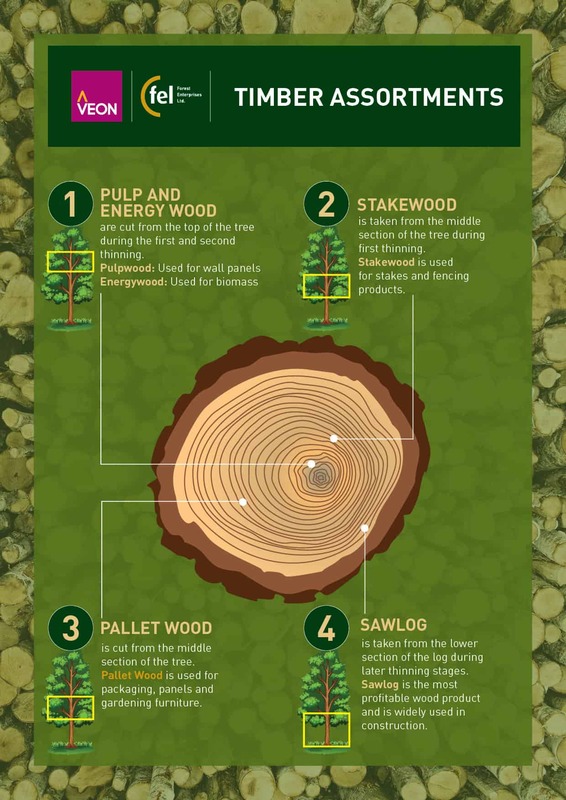 Pallet wood provides a stable forestry income and is much sought after by sawmills in Ireland and the UK. In 2016, wood-based panels manufactured in Ireland were exported with a value of approximately €200 million. Sawlog is taken from the lower section of the log, and is generally extracted during later thinning and clear-fell stages. Sawlog is the most profitable wood product due to widespread usage in the construction industry. Further wood products include sawdust (wood-pellets); bark (garden mulch), and wood-shavings (animal bedding). Additionally, in 2016 forests attracted over 18 million visitors, generating €270 million in economic activities for rural communities. Working with a Veon forester to manage your plantation, including thinning, can help to increase the yield and profitability of forestry assets. Forestry thinning removes low value stems to allow premium trees to increase in volume in a shorter period of time. For more information on forestry management and investment, call Veon on 1800 719 399 or email [email protected] to arrange a meeting.